A few months back, I wrote a blog post titled My Top 5 Moves for Athletic Strength. I thought it would be well received, as just about any post I put up with a number in the title works well. But with over 4000 Facebook Likes/Shares, and another 1000 on Twitter, I guess it was more popular than I originally expected! Let’s be honest – if you want to make monster athletes (or become one yourself), you can’t forget about power training. Here’s my list of my 5 top moves for athletic power. First and foremost, these are MY five favorite moves. You are 100% free to disagree with me on any (or all) of them. My top five moves are also the exercises you’ll see the most frequently in my programs. There are nearly universally applicable, whether we’re talking about more entry-level athletes, or seasoned veterans. Last but not least, I try to choose exercises that maximize the cost:benefit ratio. For example, clean pulls minimize the risk of an upper extremity injury (wrist, elbow, shoulder) because you take out the catch. 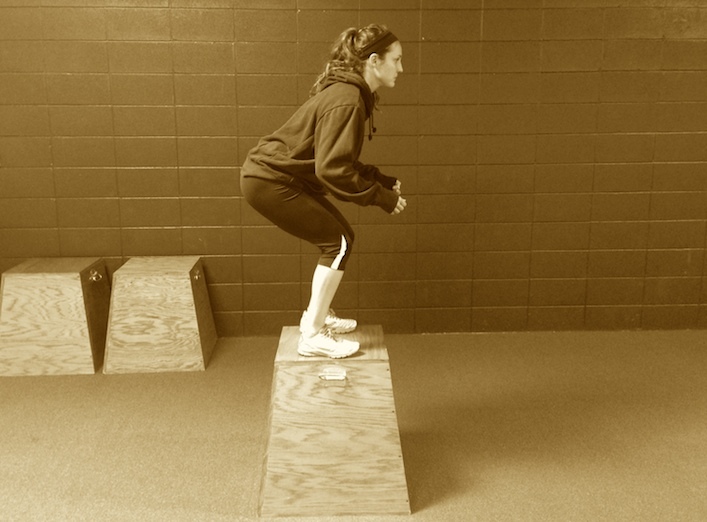 Box jumps help us express vertical power, but reduce the eccentric load when landing. And with all that being said, let’s jump into my top five power moves for athletic power! Coming in at #5, clean pulls from the hang just made the list. But before I have every Olympic weightlifting coach known to man beating down my door, let me preface this by saying I’m a huge fan of the Olympic lifts. If I have an athlete for an extended period of time, and especially if I’m building a younger athlete from the ground up, rest assured I’m going to teach them how to Olympic lift. But if I only have an athlete during their off-season, and they’re unfamiliar with the lifts, I’m going to go in a different direction. Clean pulls from the hang are excellent for vertical power expression, and I find they translate very well to vertical jump performance. I also tend to have my athletes pull from an athletic stance (versus the floor), which I’m sure will (again) piss off tons of Olympic lifting coaches. But at the end of the day, most athletes never get into extreme or full hip flexion while on the field, court or pitch, so pulling from an athletic stance has more carryover to what I’m trying to accomplish. Last but not least, I like to focus on the pull, and as such don’t worry too much about catching the bar. With football players, any time I can reduce stress on the upper extremities, I’m happy. And with basketball or baseball players, the last thing I can do is risk getting someone injured in the weight room. Working the pull allows us to maximize power production while reducing the likelihood of an upper body injury. Lateral jumps (also known as “Heidens”) are wonderful for going tri-planar with your power production and force absorption. Too often, I think we can get too linear when it comes to movement. Obviously the goal is to dominate and control the sagittal plane first, but once we have that on lock it’s time to start moving in different planes. I like to use lateral jumps with a focus on deceleration first and foremost. Jumping laterally from side-to-side is often quite challenging for athletes. When you ask them to slow down and really control the motion and their joint position, a seemingly simple exercise becomes much more challenging. So we teach the athlete how to land effectively, and control their foot, knee and hip position. But most importantly, we teach them ideal mechanics via force absorption, before we start to focus on force production. Once they’ve mastered the exercise with regards to sticking the landing and absorbing force, we can then build out to make it more reactive, jumping quickly from side-to-side. And when you factor in the ability to jump at various angles (i.e side-to-side, 45-degree angles, etc. ), it makes for an awesome exercise with tons of room for variation. They build reactive stability through the core. When you put someone in tall- or half-kneeling, you force them to stabilize their core. Furthermore, the exercise is self-limiting – because if you throw the ball explosively, you better be able to stabilize and control it on the way back! It develops upper body power. While there are exercises I’d prefer down the line for maximizing upper body power (such as plyo push-ups), this is a great beginner exericse that virtually anyone can be successful with. Half- and tall-kneeling can allow you to reduce and control asymmetries. If someone has a side-to-side imbalance or asymmetry, you can put them in half-kneeling to develop power, while also optimizing posture and position. And if someone is locked in a big anterior pelvic tilt/lumbar lordosis, you can put them in tall-kneeling to address this issue as well. Quite simply, half- and tall-kneeling med ball throws allow me to address numerous issues in one awesome exercise. Whether it’s improving upper body power production, developing reactive core stability, or addressing asymmetries, these are fantastic exercises to include in your programming. So far, we’ve addressed upper body power, lateral/single-leg power, and vertical power. Arguably one of the biggest factors in sports performance – horizontal power. This one was a tough call, because I’m a big fan of broad jumps. And just like most exercises, I love to focus on building deceleration and stability first, before focusing strictly on power production. But in this case, the forward med ball throw wins out. Not only is it incredibly easy to teach, but there’s not a lot of thought involved. Quite simply, maintain good spinal alignment, sit back into those hips, and launch that little med ball into the stratosphere! The biggest issue I see with this exercise (as well as broad jumps), are people taking a ton of time to “wind-up” to get the ball moving. Instead, think about being as fast into and out of the stretched position to maximize stretch shortening cycle development. While there was a lot of jockeying for position in my Top 5, there was never any doubt as to what my #1 exercise for power production was. I use box jumps with every athlete who trains with me at IFAST. Box jumps are not only great for training vertical power production, but the best part is that they reduce the eccentric load and pounding on the athlete. Think about it like this: If you have a very powerful athlete, they have to absorb a ton of force every time they land from a max effort jump. Now that’s not to say we won’t train this deceleration, because that’s actually a big reason I start with box jumps. Focusing on a controlled jump and sticking the landing again gives us time to develop body awareness, stability and control, before focusing on force production. Another side benefit of box jumps is that you can do them on two legs, one leg, one leg laterally, with a mini-hurdle (to add pre-stretch and reactivity) and just about any other variation you can think of. Quite simply, box jumps can do just about anything you want. Whether it’s teaching an athlete to slow down and control their landing, or maximizing power production, box jumps can benefit you. So there you have it, my Top 5 Moves for Athletic Power. But remember, these are my top five. What exercises would you choose? And one last thing – this week only (through Friday, May 31st at midnight EST), I’m putting my Bulletproof Athlete program on sale for only $97 (down from the standard price of $147). If you’re serious about following a program that will not only maximize power production, but also strength and conditioning, you need to pick up a copy of Bulletproof Athlete today! P.S. 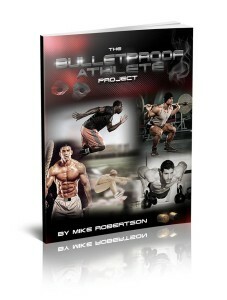 – All of the coaching videos I hyperlinked above come with your copy of Bulletproof Athlete. So not only do you have a great program, but videos of me coaching every single-exercise to make sure you get the most out of the program. Whether you’re an athlete or a coach, BPA is a great resource. Be sure to pick up your copy ASAP while it’s on sale. My Top 5 Power moves are Sled sprints with weight, medicine ball granny throws, medicine ball slams, box jumps, and band resisted broad jumps. Great list! What kind reps would you program (for power) for each of these exercises? Read my latest post on writing power training programs – it should help! Going to start incorporating some of these now, thank you very much! Good read. Yes, I’ve read it and it’s good. However, at some point you still need to choose exercises that carryover to the field/court/sport. I feel these exercises give us a lot of return on investment. Thaïs in anticipation for helping an old timer ! What are your thoughts on diminishing returns in regards to box height for jumps?